There are a large number of chemicals that are widely used in households in the developed world that may have a substantial negative impact on water quality. 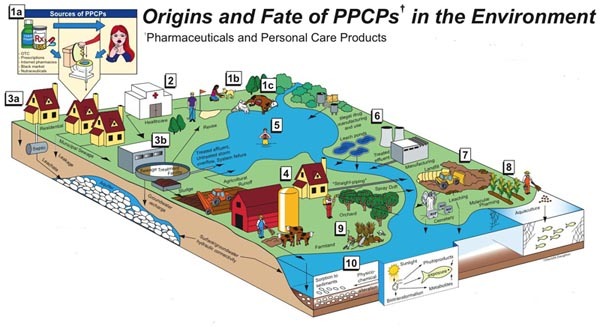 Endocrine disrupting compounds (EDCs) and pharmaceutical and personal care products (PPCPs) incorporate a group of compounds that are widely used in modern society, most of which are not naturally-occurring. These compounds are a source of concern for several reasons. First, they have been shown to have detrimental impacts on aquatic organisms. Second, they have captured the public’s imagination, and as a result there is intense interest in their possible presence in public water supplies. While it is generally accepted that the individual concentrations likely to exist in drinking water are so far below therapeutic doses that there should be no measurable effect on humans, the possibility exists that synergistic effects from multiple pharmaceuticals could render the aggregate biological impact greater than expected. Third, some pharmaceuticals (e.g., ranitidine) are believed to produce small amounts of highly toxic byproducts upon treatment with disinfectants. In addition, there are possibilities that PPCPs might be used as molecular markers for wastewater and their stereochemistry may even be able to indicate whether the wastewater had undergone biological treatment. This research will make three major contributions to the field of drinking water treatment. First, it will provide information to decision makers on effectiveness of ozone/biofiltration for the removal of a wide range of EDCs, PPCPs, their daughter products and associated endocrine activity under a competitive scenario where a mixture of these chemicals are spiked prior to the treatment process. Second, it will provide engineers and operators with preliminary key information on how to design and run ozone/biofiltration systems for effective control of these compounds. Finally, it will provide utilities with information on likely removals of these compounds under a broad range of water qualities and treatment scenarios. The results of this study will be presented in a final project report as well as in published journal articles.